Today, consumers are more environmentally conscious. So restaurants are encouraged to look for ways for their business to incorporate green or sustainable practices and solutions. There are many sustainable practices that restaurants can do – that not only attract consumers but save you money as well. One of these practices is to use eco-friendly, organic, trendy and sustainable products and services. Alsco is pleased to share with you a story about an online retailer and wholesaler of sustainable products and services, Go Green World and how they became good environmentalists. 1. What sparked the idea for you to start Go Green World? The spark of Go Green World was ignited by the Director and Co-Founder Amit Patel in 2012 when he was studying Bachelor of Business Sustainability. During his studies and through research he identified that every business whether small, medium or large is facing tremendous challenges in our resources constrained world. Businesses do not understand the role of environment and social aspect and how these factors affected the economic side of the business. Go Green World is created based on the concept of Sustainability. Go Green World believes that this is the only way to move forward in the global business arena. Amit and his partner Aziz an IT professional, Director and Co-Founder discussed the idea of Go Green World while having their cup of tea at the family coffee table and within few days the idea was converted into becoming a business that offers environmentally friendly, biodegradable, compostable and sustainable packaging solutions in Australia. 2. What is your most famous product, and why? Products that are made from Sugarcane Bagasse and Bamboo Pulp are great and lovely. Back in 2012, when we touched these products for the first time, we fell in love with them. We found these products beautiful and a great alternative to plastic products available in the market. Sugarcane and Bamboo products are made from renewable resources which were considered waste in the past. Sugarcane is grown all around the world to produce sugar. Once the juice is extracted, bagasse is left from the stick which was considered as waste and was thrown away. Now Sugarcane Bagasse is used to produce innovative disposable products that are a great alternative to plastic. 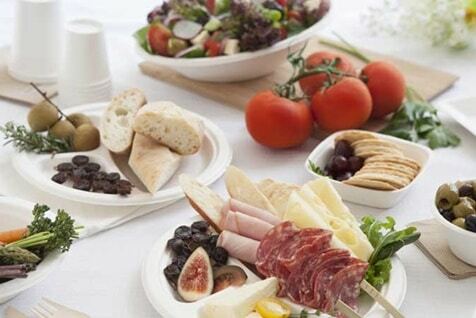 Sugarcane Bagasse products are biodegradable and compostable. 3. How do you keep your customers happy and satisfied? For Go Green World, our customers are not just customers, but we consider them as our family. Provide them with a complete understanding of the products. Suggest suitable products based on their needs to them. Offer the best available products in the market rather than marketing for any specific brand. Pass discounts to our regular customers. 4. What cost/energy saving tips would you like to share with others? line. Many businesses in Australia fail in their first years of operations because they have a lack of understanding of various costs involved in running the business. On top of this there are many government regulations to follow if you are in the food industry. There are lots of ways to save costs and energy if your business follows Sustainable Business Practices. If you are a restaurant or cafe then check your operations, investigate which process, equipment or resources is the most expensive to operate and why. Look at the alternative, environmentally friendly option to your conventional resources. For example, check your lightings to verify if they are energy efficient, check your wastage. If there is too much waste and you are paying a waste levy to your local government. Every business must have their own 3 R’s strategy which will have a huge impact to their bottom line. 5. What are the most crucial things you have done to grow Go Green World? Everything that we do at Go Green World is considered to be vital and very important to our business. At Go Green World, we believe in quality. We have grown our business tremendously in last 3 years of its operations. Our business model is quite unique and we work directly with manufacturer supplier and customers. Both the directors; Aziz and Amit spend an enormous amount of time together to offer superior quality of products, timely service and most importantly promote sustainable environment through their business model. Our business ethics is very strongly focused on Sustainable Development and we constantly engage ourselves in promoting the green economy. 6. What sustainable practices do you have at your workplace? Go Green World business model is developed based on the concept of Sustainable Development. our business is constantly evolving and adopting o change as we move ahead in the future and encounter extreme challenges of climate change. We constantly work towards reducing our carbon footprint. We work very closely with our manufacturers, suppliers, and customers to reduce, reuse and recycle resources where possible. We provide ongoing education to our customers on new environmentally friendly products and their benefits to our environment. 7. What’s the best learning experience in the business that you’d like to share to others? Go Green World has provided us the opportunity to work in the industry that is forward thinking and innovative. The concept of Sustainable Development is new to many organisations and is constantly evolving with the new research and development activities. We have experienced many innovative ideas that are and will change our lives. For example using biodegradable products was unknown to many when we started our business. When we started our business in 2012, we faced extreme difficulty explaining our customers on the concept of environmentally friendly, biodegradable and compostable products. We help them to adapt to change. We help them with the selection. We help them economically through offering discounted products. We help them to educate their customers on the benefit of using these products. Our experience with the concept of the business and products has been very memorable and we believe that we have yet to experience much more in this area. 8. What’s your top secret marketing tip that you can share with newbies? Relationship! Build a relationship with your customers. Your customers will become your advocates, they will market your products and service. There are many marketing tools available in the market from direct marketing to digital marketing but as a business you must always ensure that you maintain the quality of your products and service. At Go Green World, we are committed to the quality of our products and services and we constantly research the market for the best innovative products that we can offer to our customers. 9. What’s that one thing in your business venture that you’re really happy about? Our product line. Go green World product offerings are innovative, green, a wide range of biodegradable and compostable packaging products and constantly evolving. Alsco would like to thank Amit & Aziz of “Go Green World” for sharing this informative story on how they started and how they became good environmentalists. We want to keep our environment clean and green. Through recycling our old and unused stuff, at home or at the office – like papers, plastics, bottles, gadgets, and computers, etc. we can make a big difference. Share this information and we’ll be able to reach our Green goal. At Alsco, we always want to make sure that everyone knows the importance of recycling and make use of materials that will not harm the environment. Get to know more of our Mat Rentals – it is not only made to protect you from floor dirt but it will also protect you from slips and trips which is one of the common accidents in workplaces. Pick up your phone and call our friendly representative – 1300 659 892!